It is late in the season and everything is looking windswept but there are still some flowers braving the weather that can be cut to bring into the house. My first pairing is an alsroemeria and a seedling dahlia. The dahlia was raised from seed – ex ‘Twynings After Eight’. It should have dark leaves and white flowers but although one plant that has proved hardy was as expected, this one has yellow, bronze-flushed flowers and is none the worse for that. 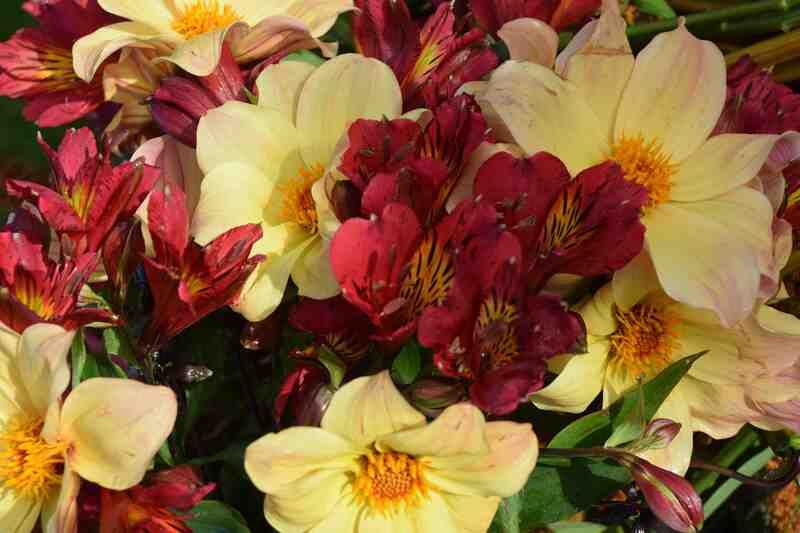 I have lost the label of the alstroemeria but it is a good plant, 1.2m high that flowers from early summer till reduced to mush by the frost. They make an autumnal partnership. Although autumnal shades are so appropriate right now, a splash or pink is very welcome. 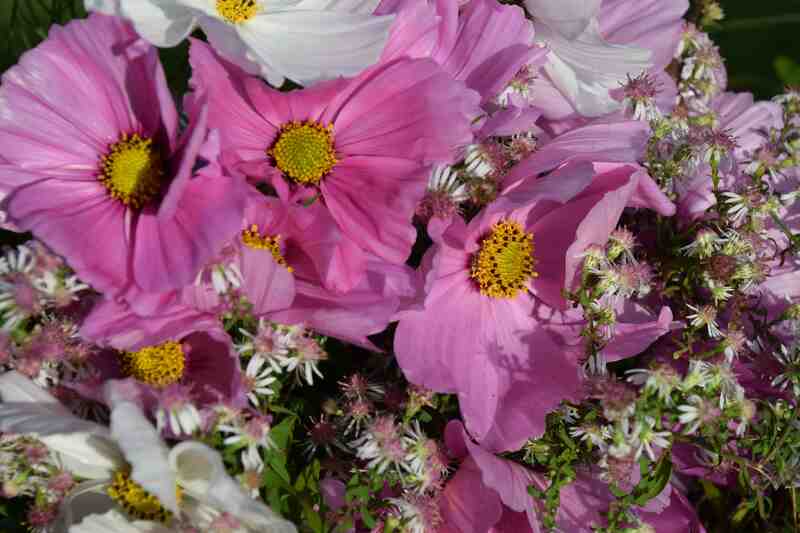 The tall cosmos are still going strong and the big daisy flowers are shown off in a mist of tiny Michaelmas daisies: in this case Symphyotrichum lateriflorus ‘Lady in Black’. This is the new name for what was an aster. The species is unusual for the upright main stems with side branches at right angles to create a self-supporting cloud of interlinked stems. The ‘flowers’ have very pale pink ray florets and mid pink disc florets. The cultivar name derives from the very dark purple foliage that looks attractive all summer before the flowers open. The most surprising combination is some sunflowers and polyanthus, a pairing that would not be possible in spring. Having been cut all summer, the sunflowers are producing small flowers from sideshoots on sideshoots while the Barnhaven polyanthus have responded to the mild weather by producing a flurry of flowers. Selecting those from the ‘Grand Canyon’ series, the colours match perfectly. 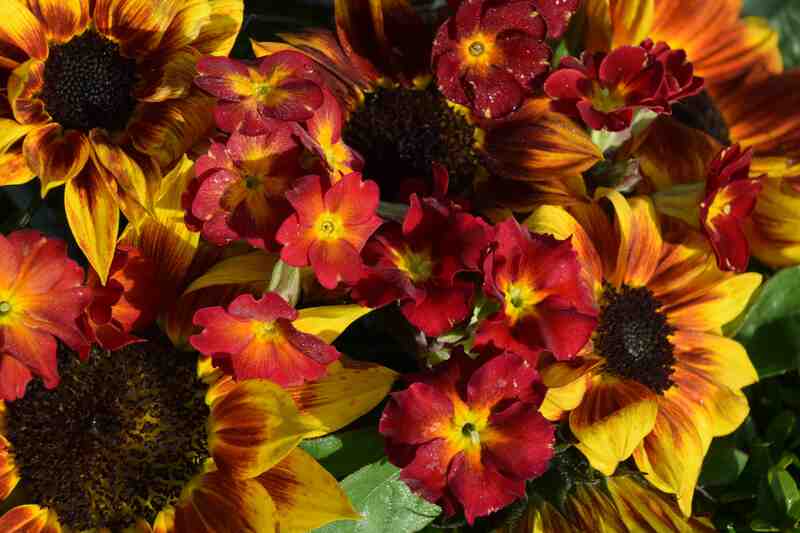 All three combinations are stunning – but the polyanthus/sunflower combo is great because it’s not one you could plan.